The SocketTools Library Edition is a suite of Windows libraries that simplifies Internet application development. The SocketTools Library Edition includes native Windows libraries that provide an extensive collection of APIs for uploading and downloading files, accessing web-based services, sending and retrieving e-mail messages, executing commands on remote servers, interactive terminal sessions and much more. 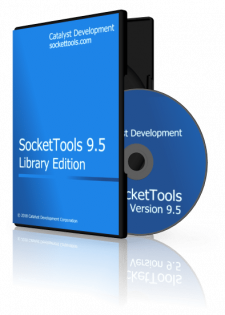 The SocketTools libraries are native Windows DLLs, compatible with Visual Studio 2015 and prior versions, including Visual C++ 6.0 and Visual Basic 6.0. Both 32-bit and 64-bit libraries are included, with support for C/C++, Visual Basic, Object Pascal, PowerBASIC, Clarion and several other languages. The Library Edition provides a comprehensive API that is very similar in design to the standard Windows API. It uses the same calling convention, and most functions use only integral data types, strings and simple structures, making it easy to use and compatible with a wide variety of development tools. A SocketTools Library Edition license includes free technical support by e-mail, and access to support resources such as our knowledge base and online help. Technical reference documentation and example programs are included with the product. If you have critical support needs, you can also purchase additional support with your license.